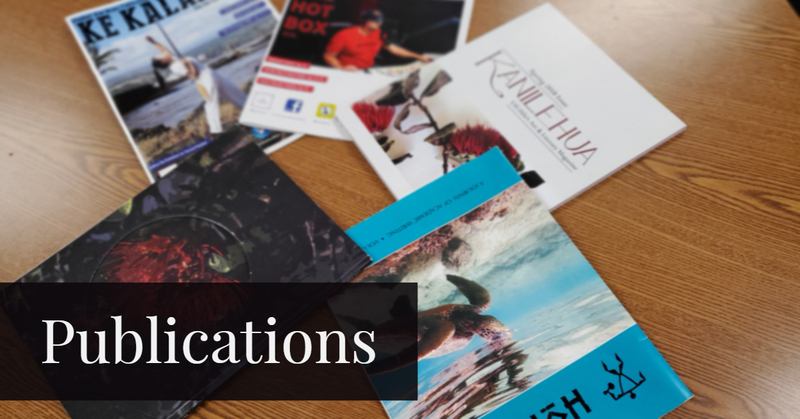 Students at UH Hilo have the opportunity to publish academic writing, research, creative writing, and art (including drawing, painting, and photography) to one of the university's student-run publications. Participants of the English program may find these opportunities to be beneficial in the process of forming a professional portfolio, as a place in the publication offers a chance for their work to be seen throughout the state. Hohonu is an academic journal published for an by the student body. Hohonu strives to showcase, share, and archive quality academic writing for the benefit of the students it serves. Students may also apply to work as a member of the Hohonu team. Kanilehua is UH Hilo's art and literary magazine. Students may submit creative writing, poetry, and works of art. Students may also apply to work as a member of the Kanilehua team. Ka Noio ʻAʻe ʻAle is an independent press housed in the English department. Ke Kalahea serves to inform, entertain, and educate its readers through a constant flow of quality writing. Subject matter ranges from current events to restaurant reviews. New editions of the magazine are published bi-monthly. Students may also apply to work as a member of the Ke Kalahea team.